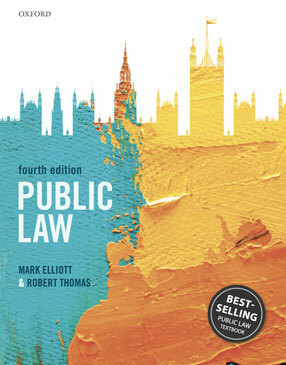 Public Law, by Mark Elliott and Robert Thomas, is a textbook aimed at undergraduate students studying modules in Public Law, Constitutional Law and Administrative Law. The third edition of the book — which is the best-selling title in the field in the UK — was published by Oxford University Press in 2017. Public Law is an advanced textbook that comprehensively covers the key topics found on undergraduate public law courses. The book presents a sophisticated and accessible analysis of the law and institutions of public law, and places the legal issues within the wider socio-political context within which the constitution operates. Three key themes that permeate the content allow students to approach the subject in a structured and easy to understand way, and questions posed throughout the chapters give students the opportunity to provide answers that show how their knowledge has increased as the chapter progresses. The key themes are: (i) the significance of executive power in the contemporary constitution and the challenge of ensuring that those who wield it are held to account; (ii) the shift in recent times from a political to a more legal constitution and the implications of this change; and (iii) the increasingly 'multi-layered' character of the British constitution. Public Law is accompnanied by an Online Resource Centre which contains updates on recent developments, together with a collection of useful weblinks. There are also additional resources which lecturers can make available to their students, including digital versions of the diagrams used in the book and a bank of self-test questions.